Collision with points is fine, but rarely do objects actually occupy a single point in space. Next, we can use the same application of the Pythagorean Theorem from the Point/Circle example to test if two circles are colliding. To check if they are colliding, we see if the distance between them is less than the sum of their radii. // radii, the circles are touching! Circle/Circle collision can be used to create "bounding circles" around more complex objects. While sacrificing accuracy, this kind of collision detection is very fast and can be a good approximation. 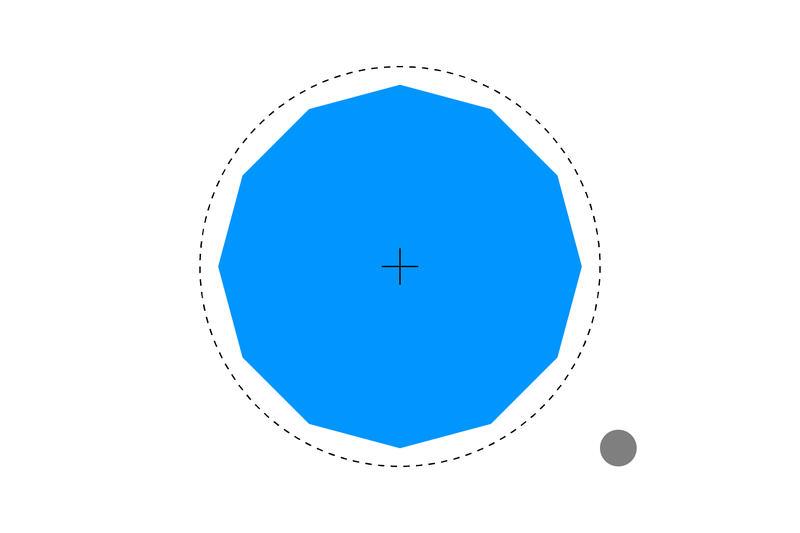 While it includes some areas that aren't part of the shape, a circle is a good approximation of this dodecagon. You may be wondering why we are only talking about circles and not ellipses. It might seem fairly similar, but the math for ellipse collision is actually quite complicated. Consider it a great challenge once you master the other collision examples!